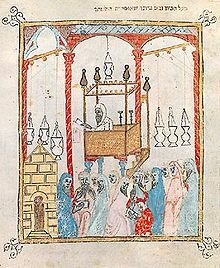 A service in a Spanish synagogue, from the Sister Haggadah (c. 1350). The Alhambra Decree would bring Spanish Jewish life to a sudden end. The edict was formally and symbolically revoked on 16 December 1968, following the Second Vatican Council. This was a full century after Jews had been openly practicing their religion in Spain and synagogues were once more legal places of worship under Spain's Laws of Religious Freedom. By the end of the 8th century, Muslim forces had conquered and settled most of the Iberian Peninsula. Under Islamic law, the Jews who had lived in the region since at least Roman times, were considered "People of the Book," which was a protected status. Compared to the repressive policies of the Visigothic Kingdom, who, starting in the sixth-century had enacted a series of anti-Jewish statutes which culminated in their forced conversion and enslavement, the tolerance of the Muslim Moorish rulers of al-Andalus allowed Jewish communities to thrive. Jewish merchants were able to trade freely across the Islamic world, which allowed them to flourish, and made Jewish enclaves in Muslim Iberian cities great centers of learning and commerce. This led to a flowering of Jewish culture, as Jewish scholars were able to gain favor in Muslim courts as skilled physicians, diplomats, translators, and poets. Although Jews never enjoyed equal status to Muslims, in some Taifas, such as Granada, Jewish men were appointed to very high offices, including Grand Vizier. However, Muslim forces did not control the entire peninsula. The Reconquista, or the gradual reconquest of Muslim Iberia by the Christian kingdoms in the North, was driven by a powerful religious motivation: to reclaim Iberia for Christendom following the Umayyad conquest of Hispania centuries before. By the 14th century, most of the Iberian Peninsula (present-day Spain and Portugal) had been reconquered by the Christian kingdoms of Castile, Aragon, León, Galicia, Navarre, and Portugal. During the Christian re-conquest, the Muslim kingdoms in Spain became less welcoming to the dhimmi. In the late twelfth century, the Muslims in al-Andalus invited the fanatical Almohad dynasty from North Africa to push the Christians back to the North. After they gained control of the Iberian Peninsula, the Almohads offered the Sephardim a choice between expulsion, conversion, and death. Many Jewish people fled to other parts of the Muslim world, and also to the Christian kingdoms, which initially welcomed them. In Christian Spain, Jews functioned as courtiers, government officials, merchants, and moneylenders. Therefore, the Jewish community was both useful to the ruling classes and to an extent protected by them. The erosion of rights the Sephardim had enjoyed under the Muslims, in Christian territories was slow and in some areas barely perceptible. As the Reconquista drew to a close, overt hostility against Jews in Christian Spain became more pronounced, finding expression in brutal episodes of violence and oppression. In the early fourteenth century, the Christian kings vied to prove their piety by allowing the clergy to subject the Jewish population to forced sermons and disputations. More deadly attacks came later in the century from mobs of angry Catholics, led by popular preachers, who would storm into the Jewish quarter, destroy synagogues, and break into houses, forcing the inhabitants to choose between conversion and death. Thousands of Jews sought to escape these attacks by converting to Christianity. These Jewish converts were commonly called conversos, New Christians, or marranos; the latter two terms were used as insults. At first these conversions seemed an effective solution to the cultural conflict: many converso families met with social and commercial success. But eventually their success made these new Catholics unpopular with their neighbors, including some of the clergy of the Church and Spanish aristocrats competing with them for influence over the royal families. By the mid-fifteenth century, the demands of the Old Christians, that the Catholic Church and the monarchy differentiate them from the conversos, led to the first limpieza de sangre laws, which restricted opportunities for converts. These suspicions on the part of Christians were only heightened by the fact that some of the coerced conversions were undoubtedly insincere. Some, but not all, conversos had understandably chosen to salvage their social and commercial positions or their lives by the only option open to them – baptism and embrace of Christianity – while privately adhering to their Jewish practice and faith. Recently converted families who continued to intermarry were especially viewed with suspicion. These secret practitioners are commonly referred to as crypto-Jews or marranos. The existence of crypto-Jews was a provocation for secular and ecclesiastical leaders who were already hostile toward Spain's Jewry. For their part, the Jewish community viewed conversos with compassion, because Jewish law held that conversion under threat of violence was not necessarily legitimate. Although the Catholic Church was also officially opposed to forced conversion, under ecclesiastical law all baptisms were lawful, and once baptized, converts were not allowed to rejoin their former religion. The uncertainty over the sincerity of Jewish converts added fuel to the fire of antisemitism in 15th century Spain. From the 13th to the 16th centuries European countries expelled the Jews from their territory on at least 15 occasions. Before the Spanish expulsion, the Jews were expelled from England in 1290 and multiple times from France between 1182 and 1354. The French case is typical of most expulsions, because whether they were local or national, the Jews were usually invited back a few years later. The Jews were also expelled from some of the German states. The Spanish expulsion was succeeded by at least five more expulsions, from other European countries. However, the expulsion of the Jews from Spain was both the largest of its kind, and officially the longest in Western European history. Over the four hundred year period the majority of these decrees were implemented, the meaning of the expulsions gradually changed. At first, the expulsions of the Jews, or lack thereof, were exercises of kingly prerogative. Jewish communities in Europe were often protected by and associated with European monarchs in the Middle Ages, because under the feudal system, the Jews were often the monarch's only reliable tax base. Furthermore, the Jews had the reputation of moneylenders because they were the only group allowed to loan money at a profit under the prevailing interpretation of the Vulgate (Latin; official for Catholics) Bible, which forbid Christians from collecting interest. Therefore, the Jews were the creditors of the merchants, the aristocrats, and even the monarchs. Most expulsions were centered on this issue: the monarch would tax the Jewish community heavily, forcing them to call in loans, and then expel them. At the time of expulsion, the monarch would seize their remaining valuable assets, including the debts owed by the aristocrats and the merchants. Therefore, expulsion of the Jews from Spain was unique not only in scale, but in its ideological motivations. Hostility towards the Jews in Spain was brought to a climax during the reign of the "Catholic Monarchs," Ferdinand and Isabella. Their marriage in 1469, which formed a personal union of the crowns of Aragon and Castile, with coordinated policies between their distinct kingdoms, eventually led to the final unification of Spain. Although their initial policies towards the Jews were protective, Ferdinand and Isabella were disturbed by reports claiming that most Jewish converts to Christianity were insincere in their conversion. As mentioned above, some accusations that conversos continued to practice Judaism in secret (see Crypto-Judaism) were true, but the "Old" Christians exaggerated the scale of the problem. More serious were the accusations that the Jews were trying to draw conversos back into the Jewish fold. In 1478, Ferdinand and Isabella made a formal application to Rome to set up an Inquisition in Castile to investigate these and other suspicions. In 1487, King Ferdinand promoted the establishment of the Spanish Inquisition Tribunals in Castile. In Aragon, it had been first instituted in 13th century to combat the Albigense heresy. However, the focus of this new Inquisition was to find and punish conversos who were practicing Judaism in secret. These issues came to a head during Ferdinand and Isabella's final conquest of Granada. The independent Islamic Emirate of Granada had been a tributary state to Castile since 1238. Jews and conversos played an important role during this campaign, because they had the ability to raise money and acquire weapons through their extensive trade networks. This perceived increase in Jewish influence further infuriated the Old Christians and the hostile elements of the clergy. Finally, in 1491 in preparation for an imminent transition to Castilian territory, the Treaty of Granada was signed by Emir Muhammad XII and the Queen of Castile, protecting the religious freedom of the Muslims there. By 1492, Ferdinand and Isabella had won the Battle of Granada and completed the Catholic Reconquista of the Iberian Peninsula from Islamic forces. However, the Jewish population emerged from the campaign more hated by the populace and less useful to the monarchs. The king and queen issued the Alhambra Decree less than three months after the surrender of Granada. Although Isabella was the force behind the decision, her husband Fernando did not oppose it, and both proved skillful at exploiting the hopes of the desperate Jewish population for monetary gain. That her confessor had just changed from the tolerant Hernando de Talavera to the very intolerant Francisco Jiménez de Cisneros suggests an increase in royal hostility towards the Jews. The most powerful proponent of the decision was Tomás de Torquemada, the priest in charge of the Spanish Inquisition. The text of the decree accused the Jews of trying "to subvert the holy Catholic faith" by attempting to "draw faithful Christians away from their beliefs." These measures were not new in Europe. After the decree was passed, Spain's entire Jewish population was given only four months to either convert to Christianity or leave the country. The edict promised the Jews' royal "protection and security" for the effective three-month window before the deadline. They were permitted to take their belongings with them, excluding "gold or silver or minted money or other things prohibited by the laws of our kingdoms." In practice, however, the Jews had to sell anything they could not carry: their land, their houses, and their libraries, and converting their wealth to a more portable form proved difficult. The market in Spain was saturated with these goods, which meant the prices were artificially lowered for the months before the deadline. As a result, much of the wealth of the Jewish community remained in Spain. The punishment for any Jew who did not convert or leave by the deadline was summary execution. The Sephardic Jews migrated to four major areas: North Africa, the Ottoman Empire, Portugal, and Italy. Some Spanish Jews who emigrated to avoid conversion dispersed throughout the region of North Africa known as the Maghreb. The Jewish scholars and physicians among previous Sephardic immigrants to this area had reinvigorated the Jewish communities in North Africa. However, in the 1490s, parts of the Mediterranean world, including Morocco were experiencing severe famine. As a result, a number of cities in Morocco refused to let the Spanish Jews in. This led to mass starvation among the refugees, and made the Jewish refugees vulnerable to the predation of slavers, although the regional ruler invalidated many of these sales within a few years. A good number of the Jews who had fled to North Africa returned to Spain and got converted. The Jews who stayed in North Africa often intermingled with the already existing Mizrahi Arabic or Berber speaking communities, becoming the ancestors of the Moroccan, Algerian, Tunisian and Libyan Jewish communities. Many Spanish Jews also fled to the Ottoman Empire, where they were given refuge. Sultan Bayezid II of the Ottoman Empire, learning about the expulsion of Jews from Spain, dispatched the Ottoman Navy to bring the Jews safely to Ottoman lands, mainly to the cities of Thessaloniki (currently in Greece) and İzmir (currently in Turkey). Many of these Jews also settled in other parts of the Balkans ruled by the Ottomans such as the areas that are now Bulgaria, Serbia and Bosnia. Concerning this incident, Bayezid II is alleged to have commented, "those who say that Ferdinand and Isabella are wise are indeed fools; for he gives me, his enemy, his national treasure, the Jews." A majority of Sephardim migrated to Portugal, where they gained only a few years of respite from persecution. About 600 Jewish families were allowed to stay in Portugal following an exorbitant bribe, until the Portuguese king entered negotiations to marry the daughter of Ferdinand and Isabella. Caught between his desire for an alliance with Spain and his economic reliance on the Jews, Manuel I declared the Jewish community in Portugal (perhaps then some 10% of that country's population) Christians by royal decree unless they left the country. In return, he promised the Inquisition would not come to Portugal for 40 years. He then seized the Jews who tried to leave and had them forcibly baptized, after separating them from their children. It was years before the Jews who fled to Portugal were allowed to emigrate. When the ban was lifted, many of them fled to the Low Countries, or the Netherlands. Throughout history, scholars have given widely differing numbers of Jews expelled from Spain. However, the figure is likely to be below the 100,000 Jews who had not yet converted to Christianity by 1492, possibly as low as 40,000. Such figures exclude the significant number of Jews who returned to Spain due to the hostile reception they received in their countries of refuge, notably Fes (Morocco). The situation of returnees was legalized with the Ordinance of 10 November 1492 which established that civil and church authorities should be witness to baptism and, in the case that they were baptized before arrival, proof and witnesses of baptism were required. Furthermore, all property could be recovered by returnees at the same price at which it was sold. Similarly the Provision of the Royal Council of 24 October 1493 set harsh sanctions for those who slandered these New Christians with insulting terms such as tornadizos. :115 After all, the Catholic monarchs were concerned with the souls of their subjects, and Catholic doctrine held that the persecution of converts would remove an important incentive for conversion. Returnees are documented as late as 1499. A majority of Spain's Jewish population had converted to Christianity during the waves of religious persecutions prior to the Decree—a total of 200,000 converts according to Joseph Pérez. The main objective of the expulsion of practicing Jews was ensuring the sincerity of the conversions of such a large convert population. Of the 100,000 Jews that remained true to their faith by 1492, an additional number chose to convert and join the converso community rather than face expulsion. Recent conversos were subject to additional suspicion by the Inquisition, which had been established to persecute religious heretics, but in Spain and Portugal was focused on finding crypto-Jews. Although Judaism was not considered a heresy, professing Christianity while engaging in Jewish practices was heretical. Additionally, Limpieza de Sangre statutes instituted legal discrimination against converso descendants, barring them from certain positions and forbidding them from immigrating to the Americas. For years, families with urban origins who had extensive trade connections, and people who were learned and multilingual were suspected of having Jewish ancestry. According to the prejudice of the time, a person with Jewish blood was untrustworthy and inferior. Such measures slowly faded away as converso identity was forgotten and this community merged into Spain's dominant Catholic culture. This process lasted until the eighteenth century, with a few exceptions, most notably the Chuetas of the island of Majorca, where discrimination lasted into early 20th Century. A Y chromosome DNA test conducted by the University of Leicester and the Pompeu Fabra University has indicated an average of nearly 20% for Spaniards having some direct patrilineal descent from populations from the Near East which colonized the region either in historical times, such as Jews and Phoenicians, or during earlier prehistoric Neolithic migrations. Between the 90,000 Jews who converted under the Visigoth persecutions, and the 100,000+ Jews who converted in the years leading up to expulsion, it is likely that many of these people have Jewish ancestry. On the other hand, genetic studies have dispelled local beliefs in the American South West that Spanish Americans are the descendants of conversos. The Spanish government has actively pursued a policy of reconciliation with the descendants of its expelled Jews. In 1924, the regime of Primo de Rivera granted Spanish citizenship to the entire Sephardic Jewish diaspora. As stated above, the Alhambra decree was officially revoked in 1968, after the Second Vatican Council rejected the charge of deicide traditionally attributed to the Jews. In 1992, in a ceremony marking the 500th anniversary of the Edict of Expulsion, King Juan Carlos (wearing a yarmulke) prayed alongside Israeli president Chaim Herzog and members of the Jewish community in the Beth Yaacov Synagogue. The King said, "Sefarad (the Hebrew name for Spain) isn't a nostalgic memory anymore; it is a place where it must not be said that Jews should simply 'feel' at home there, for indeed Hispano-Jews are at home in Spain...What matters is not accountability for what we may have done wrong or right, but the willingness to look to the future, and analyze the past in light of our future." From November 2012 Sephardi Jews have had the right to automatic Spanish nationality without the requirement of residence in Spain. Prior to November 2012, Sephardi Jews already had the right to obtain Spanish citizenship after a reduced residency period of two years (versus ten years for foreigners but natural from Philippines, Equatorial Guinea, Brazil and about other 20 American republics than also require 2 years.) While their citizenship is being processed, Sephardi Jews are entitled to the consular protection of the Kingdom of Spain. This makes Spain unique among European nations as the only nation that currently grants automatic citizenship to the descendants of Jews expelled during the European medieval evictions. Although these measures are popular in the Jewish community, they have also sparked some controversy. A minority of thinkers hold that these policies represent less the abnegation of prejudice as a shift to Philo-Semitism. As of November 2015, 4300 Sephardi Jews have benefited from this law and acquired Spanish citizenship, swearing allegiance to the Spanish Constitution. In 2013, the number of Jews in Spain was estimated to range between 40,000 and 50,000 people. ^ a b c d "The Edict of Expulsion of the Jews – 1492 Spain". www.sephardicstudies.org. Retrieved 27 June 2017. ^ a b c d e f g h i j k l m n o p q r s t u v w x y Gerber, Jane (1994). The Jews of Spain: A History of the Sephardic Experience. New York: The Free Press. pp. 1–144. ISBN 978-0029115749. ^ a b c Pérez, Joseph (2007). History of a Tragedy: The Expulsion of the Jews from Spain. Translated by Hochroth, Lysa. University of Illinois Press. ISBN 9780252031410. ^ Stavans, Ilan (1 April 2014). "Repatriating Spain's Jews". The New York Times. ISSN 0362-4331. Retrieved 27 June 2017. ^ Menocal, María Rosa (2012) . The ornament of the world: How Muslims, Jews, and Christians created a culture of tolerance in medieval Spain (Reprint ed.). Back Bay Books. ISBN 9780316168717. OCLC 183353253. ^ Kaye, Alexander; Meyers, David, eds. (2014). The Faith of the Fallen Jews: Yosef Hayim Yerushalmi and the Writing of Jewish History (The Tauber Institute Series for the Study of European Jewry). Massachusetts: Brandeis University Press. pp. 252–253. ISBN 978-1611684872. ^ a b c d Stow, Kenneth (1992). Alienated Minority: The Jews of Medieval Latin Europe. Massachusetts: Harvard University Press. pp. 181–308. ISBN 978-0674015937. ^ Anti-Semitism: Israel Pocket Library. 12. Jerusalem, IS: Keter Books. 1974. ISBN 9780706513271. ^ "Map of Jewish expulsions and resettlement areas in Europe". A Teacher's Guide to the Holocaust. Florida Center for Instructional Technology, College of Education, University of South Florida. Retrieved 9 September 2016. ^ Huxtable, Elliott John (2002) . Imperial Spain 1469–1716. London, UK: Penguin. ISBN 9780141925578. OCLC 759581255. ^ Eisenberg, Daniel (1993) . "Cisneros y la quema de los manuscritos granadinos" [Cisneros and the Burning of the Grenadinian Manuscripts]. Journal of Hispanic Philology. pp. 107–124. Retrieved 27 June 2017. ^ Flores, Carlos; Maca-Meyer, Nicole; González, Ana M; Oefner, Peter J; Shen, Peidong; Pérez, Jose A; Rojas, Antonio; Larruga, Jose M; Underhill, Peter A (2004). "Reduced genetic structure of the Iberian peninsula revealed by Y-chromosome analysis: implications for population demography". European Journal of Human Genetics. 12 (10): 855–863. doi:10.1038/sj.ejhg.5201225. ISSN 1018-4813. PMID 15280900. ^ González, AM; Brehm, A; Pérez, JA; Maca-Meyer, N; Flores, C; Cabrera, VM (April 2003). "Mitochondrial DNA affinities at the Atlantic fringe of Europe". Am. J. Phys. Anthropol. 120 (4): 391–404. doi:10.1002/ajpa.10168. PMID 12627534. ^ Di Giacomo, F.; Luca, F.; Popa, L. O.; Akar, N.; Anagnou, N.; Banyko, J.; Brdicka, R.; Barbujani, G.; Papola, F. (October 2004). "Y chromosomal haplogroup J as a signature of the post-neolithic colonization of Europe". Human Genetics. 115 (5): 357–371. doi:10.1007/s00439-004-1168-9. ISSN 0340-6717. PMID 15322918. ^ Sutton, Wesley K.; Knight, Alec; Underhill, Peter A.; Neulander, Judith S.; Disotell, Todd R.; Mountain, Joanna L. (2006). "Toward resolution of the debate regarding purported crypto-Jews in a Spanish-American population: Evidence from the Y chromosome". Annals of Human Biology. Taylor and Francis. 33 (1): 100–111. doi:10.1080/03014460500475870. PMID 16500815. ^ Zalloua, PA; Platt, DE; El Sibai, M; et al. (17 November 2008). "Identifying Genetic Traces of Historical Expansions: Phoenician Footprints in the Mediterranean". The American Journal of Human Genetics. Elsevier Inc. 83 (5): 633–642. doi:10.1016/j.ajhg.2008.10.012. PMC 2668035. PMID 18976729. Retrieved 9 September 2016. ^ Yanes, Javier. "Tres culturas en el ADN" [Three cultures in DNA] (in Spanish). Archived from the original on 21 July 2012. Retrieved 9 September 2016. [English translation] The Sephardi result may be overestimated, since there is much diversity in those genes and maybe absorbed other genes from the Middle East. Puts Calafell in doubt the validity of ancestry tests? They can be good for the Americans, we already know from where we come from. ^ Hesman Saey, Tina (4 December 2008). "Spanish Inquisition couldn't quash Moorish, Jewish genes". Retrieved 9 September 2016. We think it might be an over estimate. The genetic makeup of Sephardic Jews is probably common to other Middle Eastern populations, such as the Phoenicians, that also settled the Iberian Peninsula," Calafell says: "In our study, that would have all fallen under the Jewish label. ^ Cáceres, Pedro (10 December 2008). "Uno de cada tres españoles tiene marcadores genéticos de Oriente Medio o el Magreb" [One in three Spaniards have genetic markers for Middle East and the Maghreb] (in Spanish). Retrieved 9 September 2016. [English translation] Dr. Calafell clarifies that ... the genetic markers used to distinguish the population with Sephardi ancestry may produce distortions. The 25% of Spaniards that are identified as having Sephardi ancestry in the study could have inherited that same marker from older movements like the Phoenicians, or even the first Neolithic settlers thousands of years ago. ^ Callaway, Ewen (4 December 2008). "Spanish Inquisition left genetic legacy in Iberia". New Scientist. ^ Wheelwright, Jeff. "The 'Secret Jews' of San Luis Valley". Smithsonian. Retrieved 27 June 2017. ^ Cembrero, Ignacio (1 April 1992). "El Rey celebra en la sinagoga de Madrid "el encuentro con los judíos españoles"" [The King celebrates the "meeting with Spanish Jews" in the Madrid synagogue] (in Spanish). Retrieved 9 September 2016. ^ Minder, Raphael (22 November 2012). "Spain: Citizenship Process Eased for Sephardic Jews". The New York Times. ^ "El Rey, a los sefardíes: "¡Cuánto os hemos echado de menos!"" [The King, the Sephardim, "How I've missed you!"] (in Spanish). El País. 30 November 2015. Alhambra Decree: 521 Years Later, a blog post on the Law Library of Congress's In Custodia Legis.